WTOP Film Critic Jason Fraley breaks down Kathryn Bigelow's "Zero Dark Thirty." WASHINGTON – Its access to classified intel and depiction of detainee torture have made it a target on Capitol Hill. Now, you can see for yourself as “Zero Dark Thirty” hits theaters nationwide. Nominated for five Oscars, including Best Picture, the film reunites director Kathryn Bigelow with writer Mark Boal after their Iraq War thriller and Oscar triumph “The Hurt Locker” (2008). The duo originally set out to tell the 10-year hunt for Osama bin Laden, until reality re-wrote their ending with Bin Laden’s killing on May 2, 2011 at 12:30 a.m. The timing gave it a new title and a more satisfying conclusion, avoiding the fate of David Fincher’s “Zodiac” (2007), where audiences complained that the killer was never caught. Move over, Jodie Foster. There’s a new heroine orchestrating a night-vision climax in the monster’s lair. Bigelow has truly found her niche in capturing gritty tales of valiant heroes. Thanks to an Oscar-nominated script and Oscar-nominated editing, Bigelow’s pace is swift, covering a decade of al-Qaeda attacks in an on-going chess match between Maya and bin Laden. The film moves so well that it’s easy to overlook the symbolic details, showing the culture clash between U.S. choppers and Pakistani goats and foreshadowing danger with a black cat crossing the screen before a suicide bombing. Perhaps her greatest strength is knowing that “less is more.” Rather than using parallel action to show bin Laden scrambling inside the compound, we experience the raid strictly from the P.O.V. of the SEALs. Bin Laden’s killshot has no artificial buildup; just a shot in the dark needing further confirmation. Even after Bin Laden is dead, we don’t see a full shot of his face, only quick images on a cell-phone camera and a partial beard protruding from a body bag. Some lawmakers have complained about the film’s implication that enhanced interrogation led to the discovery of bin Laden’s courier, Abu Ahmed al-Kuwaiti. Indeed, the film depicts horrific waterboarding, dog-leash humiliation and a claustrophobic box, all at the helm of interrogator Jason Clarke, who brilliantly shifts from intimidating to conciliatory. However, the key piece of info is actually revealed during a bluff scene at a picnic table. Was this the result of all the torture in previous scenes, or is Bigelow saying the truth finally came out in a moment of calm? The way you interpret it probably depends on your own politics. Bigelow knows the truth is murky and remains as impartial as possible, showing both the strategic fruits and moral horrors of harsh interrogation. 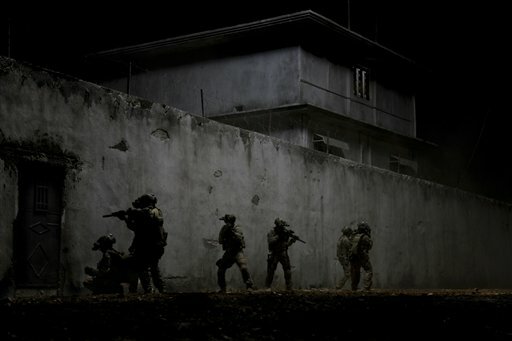 Unlike National Geographic’s “SEAL Team Six: The Raid on Osama bin Laden,” which was re-editing to include more of President Obama just before the 2012 Election, the president only appears once in “Zero Dark Thirty,” on a television during his “60 Minutes” interview proclamation that “America doesn’t torture.” Bigelow doesn’t want to be a politician; she wants to be a documentarian. Her style seems hell-bent on realistic military tradecraft, matching the true-to-life tactics of “Act of Valor” (2011), only with real actors like Chris Pratt, whose impressed reaction to Maya’s mission is priceless. The realism is brought to life by Oscar-nominated sound editing, from the silenced whoosh of the Blackhawk and Chinook helicopters to the pop of the SEALs’ laser-guided fire. As the choppers take off over the mountains under the cover of night, composer Alexandre Desplat’s escalating score brings us chills, though he was nominated instead this year for Ben Affleck’s “Argo” (2012). The fact that “Argo” and “Zero Dark Thirty” were nominated for Best Picture while “Skyfall” was not, shows that the best C.I.A. tales are plucked from reality. Ironically, Affleck and Bigelow were snubbed for Best Director, a category the latter won for “The Hurt Locker.” Perhaps voters felt she’s had her turn, despite the “Hurt Locker’s” inferiority to “Zero Dark Thirty.” In life and Oscar politics, the power of the present (a gritty Iraq War flick) can distract us from the long game (an epic hunt for bin Laden).